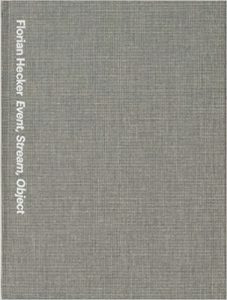 On the work of Florian Hecker, from the catalogue ‘Event, Stream, Object’ (Frankfurt MMK, 2010). As recent research in psychoacoustics demonstrates, auditory experience vexes the basic notion of the ‘object’. Whilst detaining psychoacoustics in the suspended state of a ‘potential science’ – a problematic complex of physics, physiology, biology, neurology and psychology – the unresolved nature of the ‘object of hearing’ also lends it both a peculiar philosophical pertinence, and the potential to inform radical aesthetic experiment. Florian Hecker’s work inhabits this problematic zone: a zone where the coherence of experience is breached; where objects can exist in multiple places at the same time, where events are smeared across space, where streams of experience diverge, coalesce, and fracture; a world where the conditions of objecthood are tested in a manner that is best qualified as hallucinatory. Eric Alliez has recently made hallucination the central concept of his ‘new histories of modern painting’,1 which document the ‘extreme deformation of classical organisation’2 operated by Delacroix, Manet, Seurat, Gauguin and Cezanne. In their researches and practices Alliez discerns a thread of ‘non-discursive thinking’ that emerges out of a confluence of aesthetic experiment, scientific research and philosophical reflection significantly similar to that informing Hecker’s interventions. Colour ceases to support the stablility of image forms; the intense sensations engendered by differences in colour are instead deployed as active forces that render the canvas a site of dynamic production. The painter seeks to intensify visual experience by mobilising the dynamics of visual physiology, rather than representing the seen object formally or symbolically. As painters begin to experience their practice in terms of a psychophysiological connection between the eye and the brain, the work of painting becomes one of intercepting and interrogating ‘pure visual sensation’ in advance of its capture by ‘meaning and its “visual atlas”’; and, therefore, beyond the supposed difference in kind between the real and the painted.3 Exploring and intensifying the mechanisms of the ‘eye-brain’ through the manipulation of intensity and contrast, the modern painter thus ‘paints the phenomenon of vision itself’, engendering a creation in which the viewer will also participate. One of the conditions of possibility for this ‘hallucinatory’ mode of painterly vision are the logics of sensation developed at the dawn of scientific psychology by figures such as Helmholtz, Fechner and Weber. In their work the structure of sensation, the thresholds, relation and interaction between sensory stimuli, were for the first time decoupled from any consideration of the source of sensation, divested by experimental design and mathematical analysis of all semantic content. Converging with this experimental isolation of sensation from its external source, contemporary developments in psychiatry are reappraising the relation between inner objects and their outer sources, and that between sanity and pathology, in a renewal of the notion of hallucination. Alliez’s suggestion that this reconceptualisation is parallelled in the ‘non-discursive thought’ of the modern painters’ programme of experimental hallucination rests crucially on the work of philosopher Hyppolite Taine. Inspired in his struggle against idealism by the psychophysicist project of a naturalised logic of sensation, and with reference to Boismont’s researches in hallucination, in his 1870 De L’Intelligence8 Taine develops the notion of hallucination into the first principle of a philosophical theory of perception and knowledge: Surpassing Esquirol and Boismont in audacity, Taine sees hallucination as the basic fact of mental life, and mental morbidity as consisting only in the failure of a certain limiting mechanism that retains hallucinatory perception in the service of coherent experience. For Taine, hallucination proper – in Esquirol’s definition, ‘the intimate conviction of an actually perceived sensation, when no external object apt to excite this sensation is [present] to [the] senses’9 – only exposes the truth that sensation per se is hallucination, and ought to alert us to the fact that the apparent simplicity and transparency of the act of external perception obscures a hidden synthetic art. We must not confuse the internal event of sensation with external ‘things’, we must not see the perception of externals as a ‘simple naked act of mind’,10 but should explore its active character. the imagination, when set into any train of thinking, is apt to continue, even when its object fails it, and like a galley put in motion by the oars, carries on its course without any new impulse. I am here seated in my chamber with my face to the fire; and all the objects that strike my senses are contain’d in a few yards around me. My memory, indeed, informs me of the existence of many objects; but then this information extends not beyond their past existence, nor do either my senses or memory give any testimony to the continuance of their being. When therefore I am thus seated, and revolve over these thoughts, I hear on a sudden a noise as of a door turning upon its hinges; and a little after see a porter, who advances towards me. This gives occasion to many new reflections and reasonings. First, I never have observ’d, that this noise cou’d proceed from any thing but the motion of a door; and therefore conclude, that the present phaenomenon is a contradiction to all past experience, unless the door, which I remember on t’other side of the chamber be still in being. Again, I have always found, that a human body was possest of a quality, which I call gravity, and which hinders it from mounting in the air, as this porter must have done to arrive in my chamber, unless the stairs I remember be not annihilated by my absence. I am accustom’d to hear such a sound, and see such an object in motion at the same time. I have not receiv’d in this particular instance both these perceptions. These observations are contrary, unless I suppose that the door still remains, and that it was open’d without my perceiving it: And this supposition, which was at first entirely arbitrary and hypothetical, acquires a force and evidence by its being the only one, upon which I can reconcile these contradictions. There is scarce a moment of my life, wherein there is not a similar instance presented to me, and I have not occasion to suppose the continu’d existence of objects, in order to connect their past and present appearances, and give them such an union with each other, as I have found by experience to be suitable to their particular natures and circumstances. Here then I am naturally led to regard the world, as something real and durable, and as preserving its existence, even when it is no longer present to my perception. Ultimately it is the coherence and possible unification of the imagination’s unwarranted hypotheses that comforts the sceptic.16 Hume’s account of the imagination’s continuous global reconstruction provides us with an suitable philosophical basis for the contemporary problems of psychoacoustics, in so far as it is concerned precisely with the problem of how complex, intermittent and inseparate sensory data are recombined to yield a coherent, independent and continuous world of sound sources. ‘What is heard’ cannot satisfactorily be described by a solely physical account of mechanical vibrations. Such physical analysis must be supplemented with an account of the selectivity and non-linear response of the human ear, which carries out complex transformations of these compression waves, which are then converted to neural stimulus. Yet further subsequent levels of processing must parse this undifferentiated sensory information into perceptions of discrete elements; finally, the latter must be assembled into a mental reconstruction of some external source, whose meaning for the hearer will, finally, be determined. It is in these transformations from sensory stimulus to the positing of a semantically-charged source in the world, that significant controversies in contemporary psychoacoustics begin. Central to these controversies is the disputed existence and nature of an elusive intermediary between sensation and the recognition of an external sound source – the auditory stream, event or object. the two questions concerning the continu’d and distinct existence of body are intimately connected together. For if the objects of our senses continue to exist, even when they are not perceiv’d, their existence is of course independent of and distinct from the perception; and vice versa. an object may exist, and yet be no where […] this is evidently the case with all our perceptions and objects, except those of the sight and feeling […] The same propensity to completion and coherence that leads us to postulate causal links, also leads us to locate non-spatial qualities in space, following the evidence of the spatial senses of vision and touch. Whether in the case of Bregman’s distinction between stream and event, Blauert’s auditory and sound events, or Kubovy’s auditory sources and objects, we recognise Hume’s threefold distinction between the sensory given, the unit of perception (whether object, stream, or event) synthesised from it, and the external source that is subsequently ‘recognised’ and locates the object/stream/event within a unified experience of the world – an experience, we are reminded, that is the product of a heterosensory coordination. It is precisely because this coordination customarily operates so seamlessly, that the sceptical distinction between auditory object/event/stream and sound source meets with a formidable resistance from folk-theoretical common sense, which at times even overwhelms psychoacousticians themselves: Where Kubovy and Van Valkenburg find it meaningful to describe ‘an auditory illusion in which the ‘what’ of a stimulus is perceived correctly, but the ‘where’ is perceived incorrectly’, Blauert staunchly insists that ‘if [the] positions [of the sound source and the auditory object] differ, it is an idle question to ask which is false’, since ‘[t]he sound source and the auditory event are both sensory objects’.27 Blauert’s point is that the ‘physical sound source’ is not (as one is perhaps apt to assume) a Real standing above or against merely sensory objects; it is itself a synthetic sensory construction, probably of visual provenance either directly or indirectly (i.e. through scientific instruments). We must uphold the independent reality of the auditory object against the temptation to understand it in terms of a more or less erroneous index of a visual standard. Following Hume’s scepticism, Taine’s hallucinatory logic, and Blauert’s prudence with regard to source-object causality, we must insist that such effects unmask the essentially synthetic and hallucinatory nature of all auditory objects. The effects Hecker’s work employs to block the transition from synthesis to recognition to heterosensory unification, therefore, are far from being tromp l’oreille ‘tricks’, in the derisory sense that would contrast them to some spurious sense of transparency. They must instead be considered points of leverage against our overwhelming tendency to accept as transparent and spontaneous a ‘world’ whose anticipation of integrated meaning effaces the incompleteness and open potential of its sensory vehicles. Like Taine’s rodent graft, such engineered effects do not so much lack integrity; they positively, monstrously disrupt it. It is in fact the spontaneous integration of experience and its apparent transparency that is the ‘box of tricks’: Prising open the gap between auditory object and recognised source, Hecker’s work unleashes a bombardment of oncosensory effects, creating environments of ‘uneasy listening’ in which we encounter the failure of semantic globalisation. The ear is forced to relinquish its function as reconnaissance for recognition; Deprived of their ‘visual calling cards’,31 and corresponding to no known source, sounds become strange interlopers, no longer corroborating evidence for the Office of Recognition and Integration. In the same movement, therefore, in which the operations of hearing are naturalised – becoming tractable to procedural, experimental analysis – our spontaneous image of the world becomes denaturalised – its intuitive legitimacy challenged by constructed aesthetic experience. Similarly Alliez describes how the naturalisation of the mechanisms of colour-perception yielded a concomitant denaturalisation of the image and of the eye that participates in its making: No longer dedicated to its organic function of representation, the eye becomes instead implicated in a loop of experimentation and hallucination. This emergence of eye-brain and ear-brain operationalise the key Humean insight that the senses are not wedded to representation; that the potential for extravagant delirium is constitutive of the basic mechanisms of cognitive synthesis. The mental and sensory ‘faculties’ are not exhausted by the role that they are constrained to play under the determination of a particular organic goal; they are susceptible to a ‘transcendent usage’32 that raises them to their own power rather than subjecting them to the interests of the whole. Unlike Alliez’s eye-brain circuit, then, Hecker’s war on integration must confront not only the normative tendencies of the auditory scene itself, but also the capture of the ear-brain by the hegemony of the visual. Michel Chion has named the irresistible mental fusion between sound and vision synchresis, describing it, in terms that recall the Humean imagination and Taine’s runaway ‘mental vitality’, as ‘spontaneous and irresistible’ and as operating ‘[independent] of any rational logic’.33 Drawing our attention to the startlingly powerful effect of synchronised sound – artificial synchresis – on early cinema audiences, Chion compellingly demonstrates how cinema becomes an art form dedicated to the deliberate manipulation of the drive to experiential integration – what he calls the ‘audiovisual contract’ – harnessing its ‘irresistable’ energy to make fictional worlds coherent and compelling. Reversing this procedure, Hecker’s asynchretic storm of effects breaks the contract, creating what can only be described as ‘non-integrable experience’. 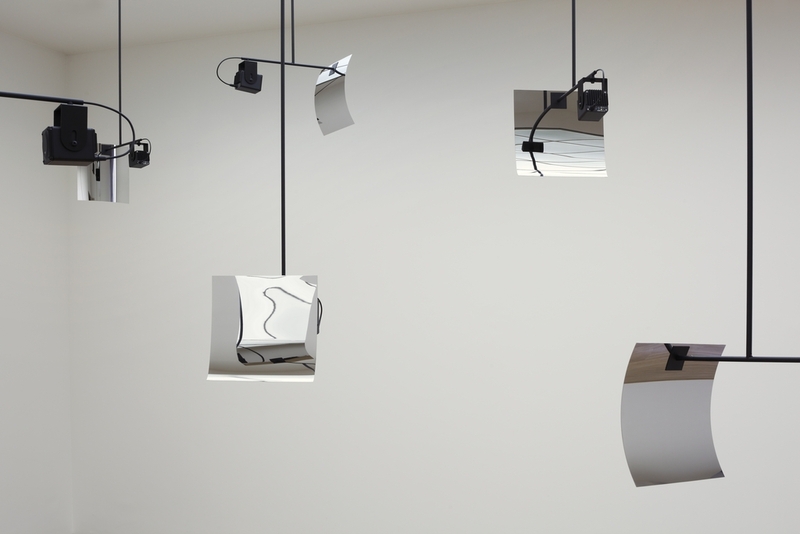 In particular, the sculptural form of Event, Stream, Object dramatises its resistance to the audiovisual contract by mocking the disymmetry of visual and auditory with mirrors that reflect crisply both sound and light. Thus, we don’t usually think of sound as ‘revealing’ to us the surfaces that deflect or transmit it to our ears: Although we undoubtedly garner valuable information from the ‘acoustic signature’ of an inhabited space, no sound, however shrouded in reverberation, is regarded as having its source in the walls; instead we use the reverberation as a cue to identify an original source. The equivalent ‘visual signature’ – the reflections of light cast by the surfaces of a space – simply is the room qua visual object, although inversely, we can pick up cues from it if we wish for some reason to determine the original source of light. The mirror is an interesting exception: its highly-polished surface disappears beneath the visual ‘echoes’ it transmits; it is a limit-case where visual objectality disappears into its own perfection: Image is no longer object. In Event, Stream, Object, the disappearance of visual transmitting surface into deflected image brings about a convergence between the conditions of visual and auditory objects: Both are revealed as being secondary transmissions whose originals have become difficult to place, in a confusing and complex play of reflection and deflection. This engineered convergence of object-conditions disrupts the normative mechanisms by which visual and auditory objects are brought to agree on a common source. Hecker’s hall of mirrors does not intensify and redouble reflection, but deflects the integration of experience from its ‘proper’ path. But whereas electronic music, particularly through the collective laboratory of dance music, has thoroughly explored these phantasmagorical auditory objects-without-sources, Hecker’s practice refuses even the metastable, shifting, fluid objectalities of electronica. This is demonstrated perfectly by the abrasively non-complementary nature of his live performances with Aphex Twin, more battles than collaborations: While Aphex spins his deftly-selected techno, Hecker appropriates fractured elements of it and unleashes them in multidimensional sprays of sound that disseminate themselves through the performance space with no regard to rhythmic or melodic congruence. Needless to say, contemporary psychoacoustic discussion moves far beyond philosophers’ purely introspective experiments and rational argument – not only owing to its carefully-controlled technologically-enabled experiments, but also in respect of the evolutionary framework that underlies them. If the cognitive mechanisms of object-construction are understood to be evolutionary artefacts, this only exacerbates the denaturalisation of the relation between object and source, and indicates further philosophical stakes. Evolutionary theory offers no guarantor for the representational bond between thought and being, perception and reality. Instead it confronts us with a disquieting continuity – cognition, and thus object-formation, is spawned from the same Nature that produces the reality which it objectifies – and an equally troubling discontinuity – our apparently immediate and transparent relation to the world is in fact the product of massively complex mediation; it is merely a special, deceptive type of opacity, a black box sealed by the interests of the organism. Not only is our access to reality, our recognition of the world, mediated by mechanisms of synthesis; those mechanisms are themselves the product of deeper, evolutionary processes. If these processes naturally favour a coherent indexing of reality (thus accounting for ‘true hallucinations’), this only makes it easy for us deceptively to mistake their mediation for immediacy. The black box is not tamperproof. Through its dis-integration, its deregulation of the senses, Hecker’s work insistently incoheres, refuses to allow us to capitulate to that false transparency. In this resistance, his continuing research into the ear-brain reminds us that we don’t yet know what the auditory imagination can do, what objects it might create, once it is freed from representation, from the dictates of rational integrity and the exigencies of nature, and unleashed into the delirium which is its proper element. Hecker’s experiments in object/stream/eventhood do not advocate any of the psychoacoustic theses outlined above. The experiences his work offers, even when they employ the ‘effects’ discovered by these models, cannot by fully accounted for as event, stream or object. It is the ‘phenomenological gap’ between the experience of this work and our best efforts at understanding how experience is constructed, that leads us back to the fundamental philosophical questions underlying the psychoacoustical research programme. Such is the ‘Hecker Effect’: An experimental programme in hallucinatory aesthetics, guided by the naturalistic discipline of science, and awakening philosophical problematics whose ramifications are far-reaching and profound. E. Alliez, L’Oeil-Cerveau: Nouvelles Histoires de la Peinture Moderne (Paris: Vrin, 2007). Paris: Baillière; English translation ‘Mental Maladies: A Treatise on Insanity’ trans. E. K. Hunt (Philadelphia: Lea and Blanchard, 1845). English Translation, A History Of Dreams, Visions, Apparitions, Ecstasy, Magnetism, and Somnambulism (Philadelphia: Lindsay and Blakiston, 1855). English translation On Intelligence, trans. T. D. Haye (London: L. Reeve, 1871). From Esquirol’s entry on ‘Hallucination’ in the Dictionnaire des sciences medicales of 1817. Hume, D. (1740) Treatise of Human Nature. Unless noted, all quotations are from Book I Part IV Sect II: Scepticism with Regard to the Senses. Hume, Treatise Book 1 Part III Section III. Of the Ideas of the Memory and Imagination. G. Deleuze, Desert Islands and other Texts (Semiotext(e), 2003), 165. Hume’s insights were to be further systematised by Immanuel Kant, whose theory of judgment reaffirms that cognition is characterised by a synthetic going beyond what is given; that cognition comprises three syntheses – the reception of sensory data in intuition; its assembling according to rule in the imagination, and its recognition in the understanding; and every such cognition involves the subject in a global reconstruction of the connected elements of a world: there can be no objects without global objectality. If cinnabar were sometimes red, sometimes black, sometimes light, sometimes heavy, if a man changed into this and sometimes into that animal form, if the country on the longest day were sometimes covered in fruit, sometimes with ice and snow, my empirical imagination would never find opportunity when representing red color to bring to mind heavy cinnabar. In effect, Kant argues that the de facto existence of a coherent realm of interconnected experience (‘the world’), constitutes a de jure ‘transcendental’ justification for the imagination’s associative mechanism: the very existence of coherent experience proves that the imagination is adapted to an external reality we cannot know. As postkantian philosophers objected, Kant thereby only secures the legitimacy of experience by exalting its empirical coherence into a ‘transcendental’ necessity. (For a key contemporary critical account of Kant’s resolution of Hume’s problem, see Q. Meillassoux, After Finitude (NY/London: Continuum, 2008). Kant does however continue to grapple with the cognitive faculties’ tendency to extravagance. Hume had introduced the notion of faculties which must unite in the common goal of unifying experience, but found himself powerless to legitimate the principles by which they achieve this. Kant indeed famously admitted that Hume thus alerted him to the pressing need to resecure the legitimacy of knowledge – who ‘awoke him from his dogmatic slumbers’; But he was equally provoked by the spiritualist Swedenborg, against whom he wrote his 1766 ‘Dreams of a Spirit-Seer’, which opens with the warning: ‘The realm of shades is the paradise of fantastical visionaries …’. Kant’s caution of vigilance against the tendencies of the faculties to project their energetic strivings into real objects is continuous from this text to his major critical works, and perhaps the movement between the dreams of a spirit seer and the vigilance of critical philosophy is the bridge between the traditional and modern valences of ‘hallucination’; from a battle against phantasmagorical spectres, Kant moves to the attempt to supply corrective mechanisms to prevent the mind from taking its own ‘foci imaginarii’ as real. There would then be a sense in which the transformation of the notion of hallucination reflects the way in which the enlightenment’s driving out of all ghosts and illusions from objective reality only drove them into the mind, making the latter a dangerous site of illusion, and giving rise to the modern fear of madness, along with the link between insanity and visionary artistic genius. Bregman, A. S., Auditory Scene Analysis (Cambridge, MA: MIT Press, 1990), 10. Hecker’s Auditory Scene (5 fold)  offers a precise dramatisation of Bregman’s work, in effect allowing us to explore the ‘map’ of the parametric conditions of stream segregation, and its thresholds, in physical space; as the listener changes position, auditory components streamed from five separate speakers assemble themselves into different groupings. Blauert, J. Spatial Hearing: The Psychophysics of Human Sound Localization (Cambridge, Mass. : MIT, 1997), 12-3. Kubovy, M. and Van Valkenburg, D. ‘Auditory and Visual Objects’, in Cognition 80 (2001), 97-126: 102. An effect employed by Hecker in No Night No Day (2009). Hecker explores this in 2×3 Channel  where, depending on the focus of our attention, we are able to shift the priority of a two constantly-transforming sets of auditory objects. Chion, M., Audio-Vision: Sound on Screen, ed. trans. C. Gorbman (NY: Columbia University Press, 1994), 32. On the transcendent usage of the faculties, see G. Deleuze, Kant’s Critical Philosophy (Minneapolis: University of Minnesota Press, 2003). Kubovy and Van Valkenburg, 98-9; Bregman, 36-8.